Sarah Burton’s second collection for Alexander McQueen has fully supported his passion for unreal silhouettes and breathtaking designer skill. For the Fall/Winter-2011 season, Sarah has chosen the colors which are typical of nature at this time – snow white, soft blue frost, and black melancholic trees with their leaves lost. All the models on the catwalk looked like the Snow Queen. They had unusual metal jewelry on the head which created the effect of icy hair. 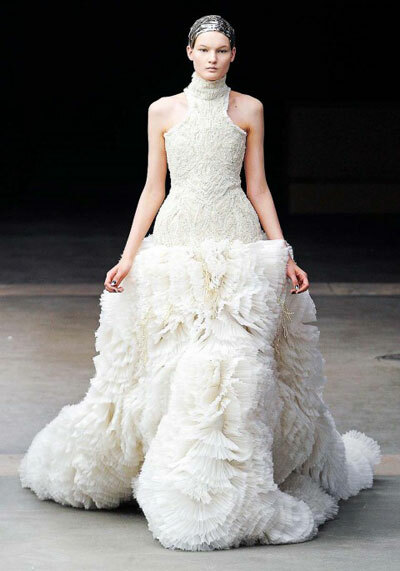 All the outfits proved to be incredibly lush and extraordinary – patterned bodices, voluminous cuffs with fur lining, as well as piles of tulle and feathers gently laid down on the dresses like sprigs of fern. Source of the image: Violetapurple. Next articleWhat's Gwyneth Paltrow's Family Problem? Absolutely love these clothes and pics. 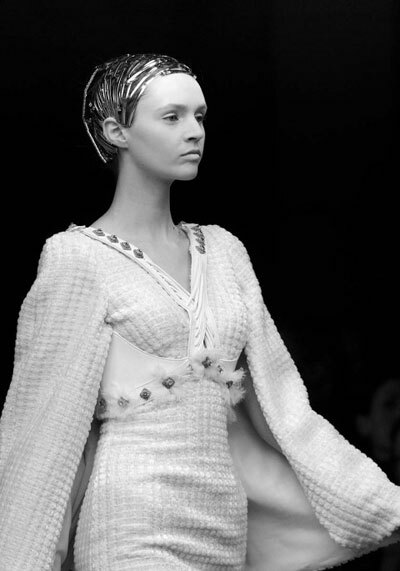 Alexander McQueen truly is a clothing design inspiration.